Charming and contemporary, the Helsinki breakfast bar stool in light grey PU is securely set out to make your morning coffee your favorite time of day. Fixed at the finest height the Helnsinki bar stool emphasizes the elegant shapes of this kitchen stool. The four long base legs are made from beech wood and have been designed to be securely held in place by four smaller wooden pieces that create a faultless footrest. Completed with each leg having invisible nylon fitted to the bottom to prevent any scratches to your floor, the Helsinki is a beautiful stool that is guaranteed to please. This Helsinki light grey bar stool will create a simple, elegant ambience to your kitchen counter or breakfast bar area. Helsinki Wooden Bar Stool Light Grey. 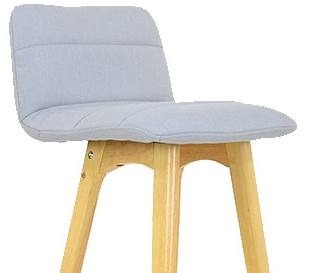 This stool is set at a fixed height with a sturdy frame.